I have a 1940s Epiphone Century archtop that had a damaged pickguard when I bought it. The remnants of the pickguard had an E logo on the corner and I'm wondering if I need to have this transplanted onto my new pickguard when I have it made. I've uploaded a picture for comparison. The pictures show two Epiphone Century Spanish models from c. 1948. Note the "Tone" and "Gain" dial plates which are typically seen on these only in the immediate post-war period. The example on the left has a nonadjustable Tone Spectrum pickup which Epiphone introduced around 1948. The example on the right appears to have an older Epiphone pickup retrofitted(?). 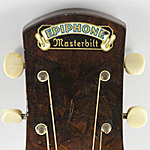 The E logo on the pickguard was not introduced before 1949 when the Century received a nonadjustable "New Yorker" pickup without the "Tone" and "Gain" plates. So a 1948 Epiphone would look perfectly correct without E logo on the pickguard. (However the damaged E logo pickguard could be original if the guitar didn't leave the factory before 1949 for some reason, but more likely it was a 1950s replacement because the original got damaged).